Bleep supply EPOS solution for ASICS pop-up stores at European Marathons. 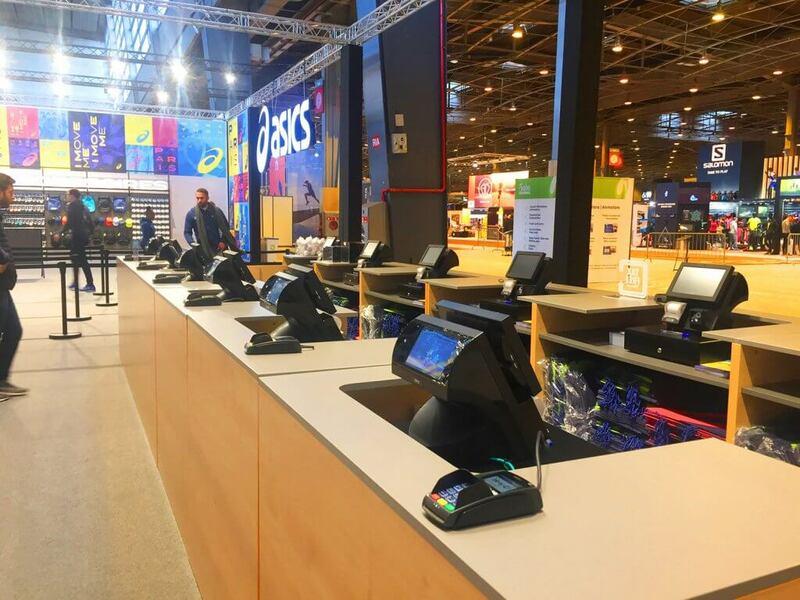 Earlier this month, Bleep UK PLC installed a pop-up EPOS solution for ASICS at the Salon du Running Exhibition in Paris, which runs alongside the Schneider Electric Marathon de Paris. Salon du Running, a show completely dedicated to running, took place from April 5th to April 7th 2018. As well as being the location from where Paris Marathon runners collect their race number bibs, ASICS, the Japanese based global retailer, who specialise in running shoes, 23 and sports equipment, opened a 1000 square metre pop-up store at the exhibition where visitors and runners alike could make purchases. Items on sale included a variety of running shoes, accessories, commemorative garments and special Marathon souvenir collections. All transactions were processed by Bleep’s compact TS-910 terminals, all supplied with built-in printers, scanners, and integrated customer facing POS Media displays which played ASICS advertisements and videos. Ingenico iPP350’s managed and processed all card payments, while real-time sales reporting was provided by Bleep’s cloud-based Web Back Office. 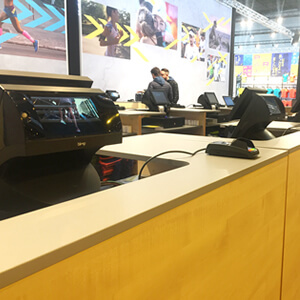 Bleep provided a similar set-up to ASICS back in March during the Zurich Marató de Barcelona (Barcelona Marathon), providing a near identical EPOS and Payment solution to their pop-up store at the ExpoSports event. ExpoSports is the sports fair that runs parallel to the marathon in Barcelona, dedicated to running, trail and triathlons. Bleep will provide a similar system in May/June 2018 at the ASICS Stockholm Marathon, with a vast number of high profile new and existing event contracts taking place throughout the summer months. Bleep UK PLC is an award-winning designer and manufacturer of Electronic Point of Sale (EPOS) systems and Payment solutions for retail, hospitality and events, including bars, nightclubs, pubs, restaurants, hotels, bakeries, fast food, stadia, arenas and world’s biggest and best sporting and music events. We have over 35 years’ experience providing bespoke, innovative, flexible and reliable EPOS and Payment solutions for any business, for any requirement, in any industry.